The list of 10 finalists for the Hobey Baker Award are down to three as the Hat Trick of contenders enter the final round of voting. The winner of the 39th annual award will be announced Friday, April 12, live on the NHL Network at 6 PM ET. This year it’s all about the blue line as the Hobey Hat Trick is made up of three distinguished defensemen. D | 33 GP, 9 G, 39 A, 48 pts. Fox just finished up his third collegiate season, but has made a bit of noise in the NHL during his time with the Crimson. Over the summer, the 2016 66th overall pick’s NHL signing rights were traded from the Calgary Flames to the Carolina Hurricanes in a blockbuster deal. This week, his name made the rounds again as reports surfaced that he informed the Hurricanes he does not intend to sign with the team, laying the groundwork for another possible trade. Fox posted his second 40-point season and third campaign finishing above a point-per-game pace. He led the Crimson in scoring with a 17-point margin. But he’s far more than offense; his presence in his own zone is large and his skating is excellent. He possesses all of the tools needed for NHL success as a defenseman, and his spot in the Hat Trick is much deserved. D | GP, 16 G, 32 A, 48 pts. 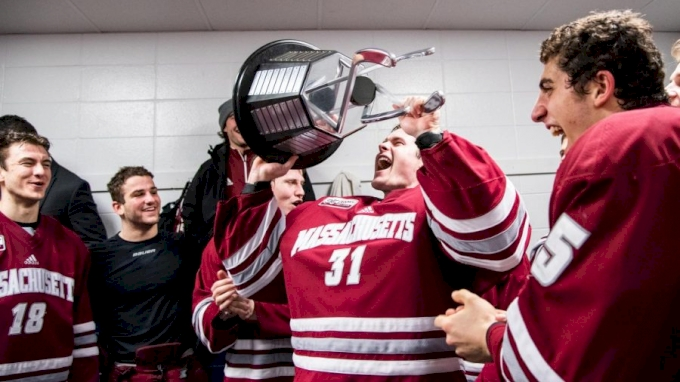 Makar is the lone nominee still competing for the 2019 NCAA crown as he carried the Minutemen into their first-ever Frozen Four appearance in program history. Drafted fourth overall in 2017 by the Colorado Avalanche, the blue liner is as dominant as they come with the full skillset of a future No. 1 defenseman with game-changing tendencies in all three zones. With one more point, he’ll surpass Fox as the leading defensive scorer in the nation, while his plus-32 rating sits third in the nation. He’s blossomed after a so-so freshman season in 2017-18, and at 20, he’s just scratching the proverbial surface. As a sophomore potentially jumping to the NHL come season’s end, many believe the Hobey Baker Award is Makar’s to lose. But he’s stated time and again it’s not about the individual awards, and the co-captain will be the first to say it’s about the trophy at the end. D | 39 GP, 10 G, 25 A, 35 pts. Everybody loves an underdog and in this race, that dog is Schuldt. The undrafted defender’s sole link to the NHL was attending development camp with the Vegas Golden Knights over the summer. But the lack of the spotlight—compared to Fox and Makar—could be the recipe for claiming the Hobey Baker Award. The 23-year-old posted four solid years in the NCAA and captained the overwhelmingly powerful Huskies for the previous three seasons, quietly placating to his duties and maintaining the performance demanded from the annually contending program. Named the NCHC Player of the Year and Defensive Defenseman of the Year, Schuldt’s offensive prowess and physical play were too impressive to go unnoticed. Upwards of seven teams were pursuing the coveted free agent before he ultimately signed a one-year contract with Vegas. Don’t miss the 39th Annual Hobey Baker Award Ceremony, Friday, April 12, on the NHL Network at 6 PM ET. Or stream it live at HobeyBaker.com. Have a question or a comment for Jacob Messing? You can find him on Twitter.